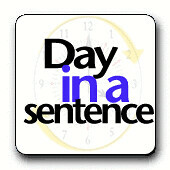 This entry was posted in Day in Sentence, Homepage and tagged dayinasentence. Bookmark the permalink. Then join us for an all-day conference on May 15th. Nowhere else will you have an opportunity to meet and network with fellow education bloggers, participate in panels, attend workshops, and help tackle some tough questions on the state of education in America.